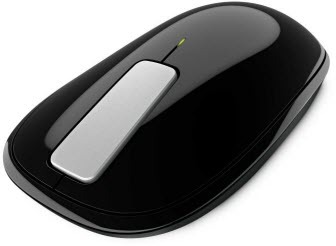 The new Explorer Touch Mouse announced by Microsoft takes the touch strip technology to the next level by delivering a strip with both vertical and horizontal navigation. The advantage with this is that it allows you to swipe your mouse in any direction. Not only does this result in easy navigation, the scroll wheel will allow for three speeds of scrolling – slow speed for precise movements, medium speed to advance a page or two, or hyperfast speed to flick quickly through a long document. Promising 18 months of battery life, the Explorer Touch Mouse will be available in Septemeber for $49.95 and can be ordered here at Microsoft Hardware. Looks cool. Don’t know if I’m ready to give up an actual wheel but I sure would like to try it.